The City of Yuba City is the project lead on this $70 million Bridge construction project, in collaboration with the City of Marysville, Sutter County, Yuba County, California Department of Transportation (Caltrans), the Federal Highway Administration (FHWA), and Sacramento Area Council of Governments (SACOG). The 5th Street Bridge is a vital conduit for regional movement of goods and services between state highways and the many regional jurisdictions. The project will replace the existing two-lane bridge with a new four-lane bridge across the Feather River to connect 5th Street in Marysville, CA to Bridge Street in Yuba City, with an estimated completion of spring 2020. This photo, according to the Community Memorial Museum of Sutter County, is a bridge constructed in 1861 across the Feather River. Sutter County built a bridge across the Feather River in 1861 that withstood the great flood of 1861-62 and stood for several decades. Sutter County’s estimated cost was $37,000 in 1861 and charged a toll fee until 1871 when the bridge costs were covered by the toll charges. Artist Rendering of the new 5th Street Bridge overlook span looking over the Feather River. 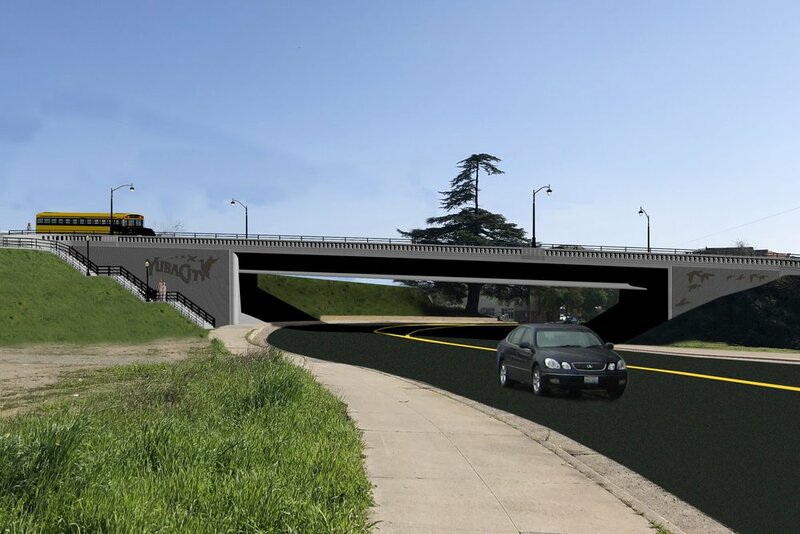 Artist Rendering of the Second Street underpass and new pedestrian staircase in Yuba City, CA looking south at the bridge. 5th Street Bridge east bound off-ramp onto 5th Street in Marysville, CA. Artist rendering of the soundwall construction on the Yuba City (Bridget Street) side of the 5th Street Bridge. Artist rendering of the Bridge Street on-ramp going east on the 5th Street Bridge.